HT23-200-6 stepper motors and CNC xPro board? Discussion in 'Motors' started by jeffmorris, Feb 21, 2018. I took three HT23-200-6 stepper motors off an old CNC router that I built about 10 years ago. Will they work with CNC xPro board? I can't find specs for HT23-200-6 motors but I found specs for HT23-180-8 and HT23-260-4 motors at Probotix (PROBOTIX 260 OzIn 4-Wire Stepper Motor). 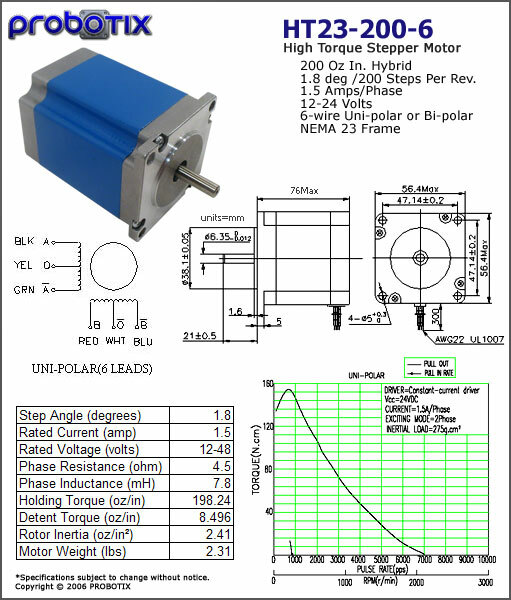 The HT23-260-4 motors draw 2.5A per phase. Rick, Thank you very much for getting me the specs for HT23-200-6 motor. here is the website description.